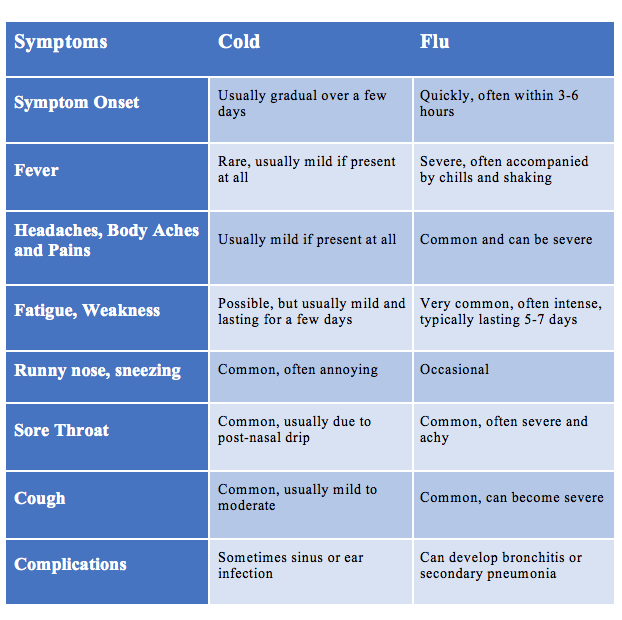 Cold or Flu: How Can I Tell the Difference? Got the sniffles? Sore throat? Body aches and pains? Fever? You might be suffering from a cold or the flu. But how can you tell the difference, and what can you do about either one? Winter brings greater exposure to cold and flu viruses and, therefore, greater risk of infection. It’s important to know the difference and how you and your family can cope. It is often difficult to tell whether you or others have a cold or the flu. As the following chart shows, however, differences in symptoms are often apparent. Usually over-the-counter (OTC) or home remedies can relieve symptoms of colds. There are a wide variety of OTC medications to ease nasal congestion, coughs, and mild fever. But with all OTC medications, be sure to observe label directions and dosage limitations. Do not exceed dosage limitations for acetaminophen (over 59,000 persons were treated for overdosing last year). And do not give aspirin to children or teenagers, since doing so following a viral infection can result in Reye’s syndrome. Other home remedies include chicken soup which can have anti-inflammatory ingredients and can help relieve nasal congestion. Honey, sometimes with lemon, when consumed in tea or alone, can relieve coughing. Above all, rest and drink fluids. Many of the same OTC or home remedies that relieve cold symptoms can help also with flu symptoms. These medications are not cures, but they can reduce duration of symptoms. They are most effective if administered within 48-72 hours of the onset of flu symptoms. If you are pregnant, are over 50 years old, have a compromised immune system, or have a chronic disorder such as diabetes, you should seek medical attention if you get the flu. Because of the risk of complications such as bronchitis or pneumonia, you should see a clinical provider within 48 hours of the beginning of symptoms. It is almost impossible to keep from catching a cold. The rhinovirus can be transmitted by airborne droplets from infected persons who sneeze or cough. It can also be transmitted by direct contact with an infected person or surfaces that such a person has touched. Basic hygiene, such a frequent washing of hands, and avoiding contact with infected persons or surfaces (such as doorknobs, countertops, railings) are the best preventative measures. In addition, try to avoid touching your own eyes, face, nose, or mouth if you encounter others who have a cold or you are in a public place. To reduce the chances of getting the flu, use the same measures above that help to prevent catching a cold. Also, you should know that a cold cannot morph into the flu because colds and the flu are caused by two very different viruses. 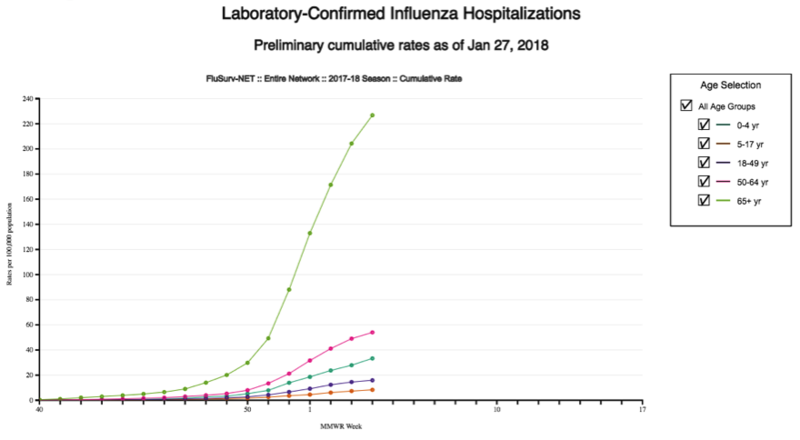 Very important: The most effective way to prevent getting the flu is to get a flu shot every year. While experts recommend getting a flu shot by the end of every October, you can still get a flu shot in the late fall or early winter. Peak effectiveness begins 2-3 weeks after you receive your shot. For more information about flu shots, see our recent blog, Get Your Flu Shot Now! If you or your family have questions about symptoms and whether you have the flu, come to Kathy’s Urgent Care so that we can resolve your concerns. 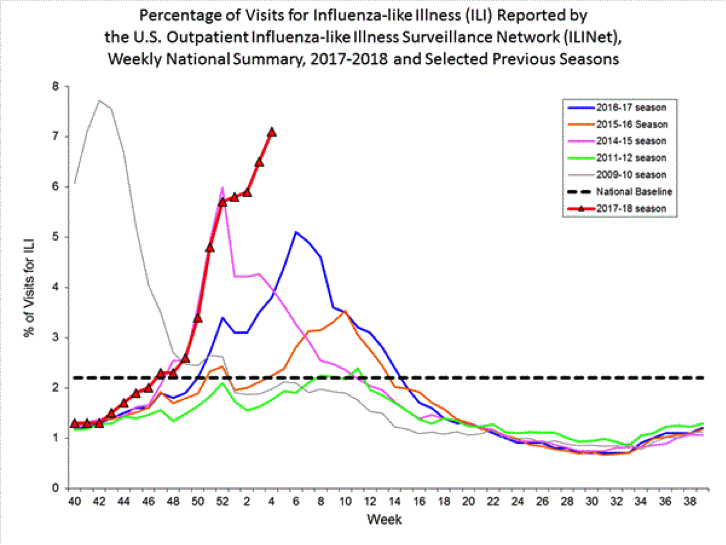 If you do have the flu, we can help you feel better and avoid complications, especially if you visit us within 48-72 hours of the onset of symptoms.